National Book Auctions of Ithaca, New York's upcoming October 2 sale promises a variety of important antique and vintage books. Among the auction's star lots is a hand-illumined vellum manuscript, several important signed volumes from noted authors, early American history works and an assortment of vivid, colourful posters. Also appearing is an extensive collection from the 1893 Columbian Exposition (a World's Fair held in Chicago in 1893 to celebrate the 400th anniversary of Christopher Columbus's arrival in the New World in 1492). Elsewhere several antique printings will be offered, including Latin and German titles from the 18th and early 19th centuries alongside, and even an original manuscript dating from around the 14th century. The circa 14th century piece is apparently on vellum leaves and is likely of French origin. Other auction highlights include a signed copy of "The Complete Poems of Robert Frost," autographed by the American Pulitzer Prize-winning poet. This limited edition work is signed on the colophon by Robert Frost, as well as the artist Thomas W Nason and the designer Bruce Rogers. A raised stamp is on the colophon page reads: "This is one of 15 presentation copies - Out of Series." 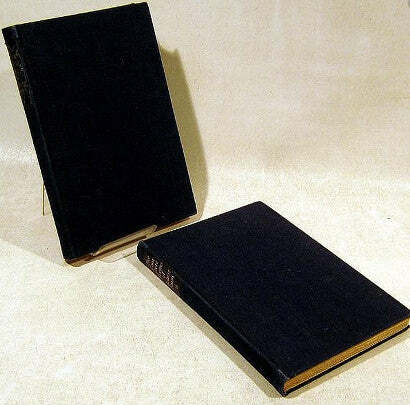 According to National Book Auctions, this lot comes from the private collection of the previous owner of a New York City book printing company, from whose collection many other works will also be sold. 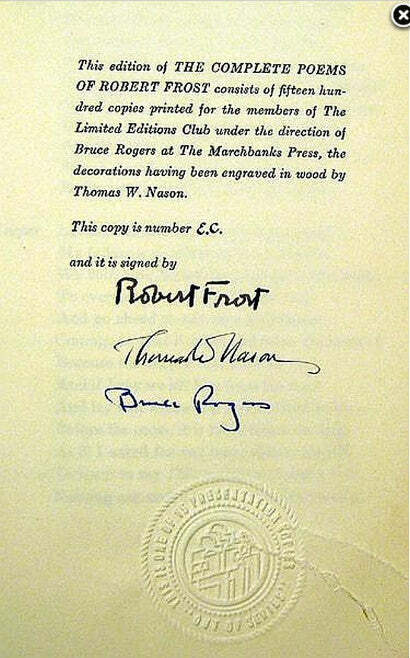 The Frost lot certainly 'ticks all the boxes,' being a limited-edition and seminal work which bears the autograph of its writer. Also offered are volumes signed by literary greats such as Aldous Huxley and Edgar Lee Masters. Watch this space for more news on National Book Auctions' October 2 auction.